^ Anne's children are fine. Time will tell about Edward's children. There are weird dynamics in that family. 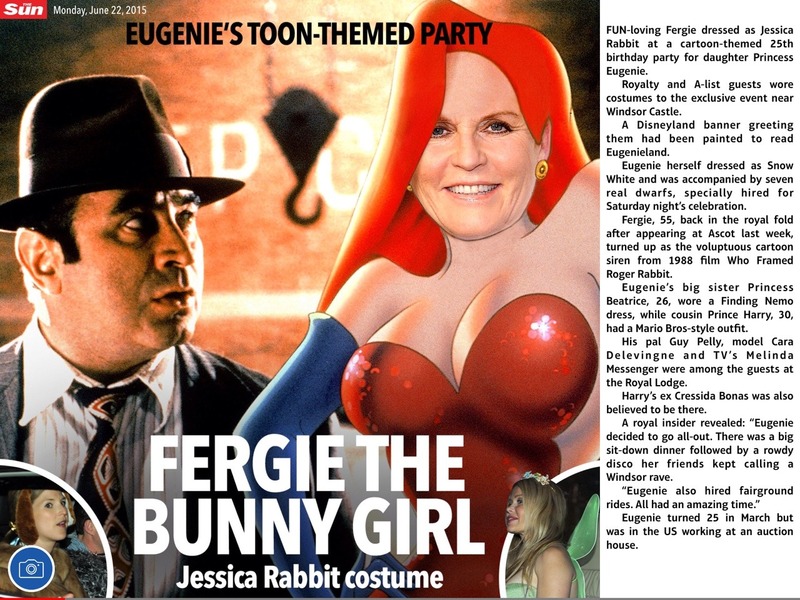 It was billed as a 'fancy dress rave' and guests arriving to celebrate Princess Eugenie's 25th birthday at the Royal Lodge at Windsor last night certainly seemed to have got the memo. Among the revellers to turn up for the Disney-themed bash was club owner Guy Pelly, an old friend of the royals, who was wearing what looked like a furry onesie. Mr Pelly, who brought his American heiress wife Lizzie along for the evening, was also joined by former TV presenter Donna Air, the girlfriend of the Duchess of Cambridge's brother James Middleton. Other guests at the party are thought to have included her sister Beatrice, 26, parents Prince Andrew and Sarah Ferguson and cousin Prince Harry. Eugenie, whose actual birthday was in March, is said to have come dressed as Snow White - and was even accompanied by seven dwarfs hired especially for the occasion. Speaking ahead of the party, a friend said: ‘She has even written on the invitation that no one else is allowed to come as Snow White, presumably because she doesn’t want any competition. The party, which was held in seven interlinked circus-style tents, is said to have included live DJ sets, while inside the tents were cocktail bars and a chill-zone for footsore ravers. Such gross extravagance. Taxpayers struggling to make ends meet, pay their bills, feed their kids, clothe them, reliant upon food/clothing banks. We fund this lot and they throw a party that would see one of these poor families in clover for at least a year. Excuse me if I pass on saying Happy Birthday, I do not feel I can bring myself to do so in the cirucmstances. James M was invited? How random. Is Donna their friend? I don't see having a party as a problem and then they are not even part of the RF. They've been reviled in the press and they cannot do anything well to please anyone. If I were them I would also live my life and that's it. But the party with the topic and all is bad taste. Let's us have a view of the jet going on and is in general not pretty. Eh, the party put money back into the economy -- costume rentals, caterer, liquor, etc. Also, Eugenie IS working. She got a college degree, she got a job, she moved away from home for a couple of years. She really is doing something with her life. She's from a rich, privileged family and this type of thing is what they do. It doesn't fret me. "and was even accompanied by seven dwarfs hired especially for the occasion." Miss Hathaway, I see your point but it's still tacky. I think that society parties offten use pr companies to make up the numbers to make the party seem a success. That's the only reason i could think of for having Donna and James there. As a poster said, they don't seem to be part of the royl family and would hang out with Eugenie. Lets see if this party will be covered in Tatler or Hello. I know rich people do this kind of thing but it was in extreme bad taste and in total poor judgement. Here are some pictures. Scroll down to see the story. Really lowering the tone even further (if possible) with the loser cupcake there. They certainly know how to turn the British public against them. Found these two pics on a social media site. They say the apples never fall far from the tree don´t they. In her case she has two trees to fall from. ^Strange re cupcake there. Reckon ma pulled flanker, or cupcake procured an invite with the party people. We all know the Yorks intensley dislike the medds en masse. Odd that he has never been invited before. Highly likely medd behind it and once he turned up little anyone can do. The dislike between the Yorks have for the medds is very strong, no way do I personally think the invitation came from Eugenei. Back door invite somewhere along the line IMO. ^^As someone has already mentioned, the British public doesn't like them regardless of what they do. The public called them scroungers and to get a job. Eugenie went and got a job and suddenly it's "Oh, she only got that job through family connections." Beatrice seems like an absolute flake even she's not that horrible. For all the crap they do do they get way more shade thrown at them then necessary, especially when you consider the feral lack of praise their charitable pursuits receive. As for the forgotten Middleton, I think Donna took him as a plus one. The British public don´t like them because they are lazy and never have been keen on work - which means that they do very little. When they do have a "job" they don´t appear to work hard at it. Beatrice has had what, 5 or 7 holidays already this year, having given up her job December/January time. Yes, let them do what they want, I am fine with that, but daddy funds them, his mummy funds him, and the taxpayers fund her, so whatever way you look at it they are taxpayer funded. With the man in the street struggling to survive it does not go down well, and why should it. Those pour souls probably can´t afford a day out to the seaside with their kids, let alone one week abroad, and they pay taxes to fund the York girls. IMO it is no wonder they are called out on it. I can afford holidays, but I still resent my taxes going towards funding the two lazy York girls, and from what i read and hear many feel the same. Beatrice and Eugenie were disliked before they even finished college. They never could win. William went to the same tacky parties a couple of years ago and he is still the golden child. Whatever they do they will criticise them. @empirestate yes I also think Donna is friends with them, I remember an article mentioning the connection but was not sure. ^You are right. The York girls have been criticized their whole lives because of their parents. It is apparent that Andrew has drilled in their heads that they should be working for the monarchy, and I think that is why Beatrice is "waiting". Eugenie, even better, moved to the States and has had a job. I don't know what her duties are or how difficult it is, but apparently her employer was satisfied with her. I would imagine it's just as hard as putting on a long dress and jewelry and going to a wedding, and then dinner and dancing afterward and then three days of fancy hats and dresses at a horse race for Sophie. Yet, Sophie is considered to be "hardworking" and Eugenie, who is gainfully employed is not. Boggles the mind, it does. ^So at 30 you cannot choose who are your close friends? ^ Of course ... yes. and I can also give opinions. Andrew and his family - has defects, have involved in scandals and are united. Anne and her family - has defects, have involved in scandals and are united. but contrary York' family .... they do not make it 'a brand',not 'provoke' the people, not bring more unpopular and critical to the monarchy. and Yes, I would be very happy to see Harry on holiday with Princess Anne and her family.